Pedaling for St. Pats RideJoin hundreds of cyclists for your choice of ride across the city. Three courses to choose from ranging from a family friendly course to a grueling but amazing ride from Downtown to the top of Woodmen at Blodgett Peak and returning for a party and stroll through the parade. Note: Due to the Blizzard, we have cancelled the Ride for 2019. The trails are in too bad of condition! 🙁 Check back with us next year! Join hundreds of cyclists for your choice of ride across the city. Three courses to choose from ranging from a family friendly course to a grueling but amazing ride from Downtown to the top of Woodmen at Blodgett Peak and returning for a party and stroll through the parade. 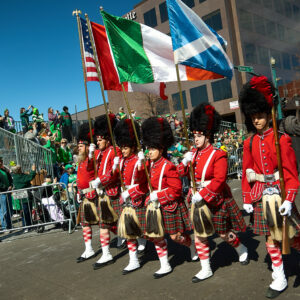 Ride in the St Patrick’s Day Parade! Registration is confusing and unclears as to what I am buying. I would like to rgistester for the 50k bike ride. Not necessarily VIP, but options and pay is difficult. Unless this thing Costs 75$ in which case I’ll decline. Hi Maureen, My apologies for not getting back to you sooner. I have fixed the Bike Registration page and you can now sign up for $40.00. You have to answer yes on the 1st option and No on the next two options. Thanks for your patience! i clicked “no” on both and got $115 for the intermediate ride. Hi Joy, My apologies for not getting back to you sooner. I have fixed the Bike Registration page and you can now sign up for $40.00. You have to answer yes on the 1st option and No on the next two options. Thanks for your patience! I selected “no” for both items and the dollar total was $115. Your page is not working. I click “no” for both and total is $115. I click “yes” for both and total is $105. I’m going to have to pass this year. When I go to the route for the Intermediate bike race, it says that the route is from 2018. Will the 2019 route be the same? This will be my first time doing this race so I have no idea how often this route changes. Purchase the all new Pedaling St. Pats Bike Jersey designed and manufactured by PRIMAL. Limited quantities available. Our Host Hotel will not have rooms available this year. However, the Beer Tasting will be open on Saturday Afternoon after the ride. The Family course is 8 miles long and mostly flat. Course stays mainly on the Midland Trail almost to 31st Street. There is a rest stop at the turn-around and comes back down the Midland Trail to the Pikes Peak Greenway Trail to downtown where they finish in the Parade. The intermediate course is 21.7 miles long and the steepest hills have been bypassed. CANCELLED DUE TO Blizzard destroying parts of the course!!!!!! !